The Walking With Our Sisters art and ceremonial installation is open now at Mount Royal University in Calgary. Jeremy Harpe of CFWE-FM spoke with spokesperson Autumn Eagle Speaker about the installation of 1655 vamps (beaded, quilled or otherwise decorated moccasin tops) that make up the exhibit, submitted from people the world over. They represent missing and murdered Indigenous women and girls and two-spirit relatives. It’s a travelling art installation that’s been shown in communities across Canada and the U.S since 2013. 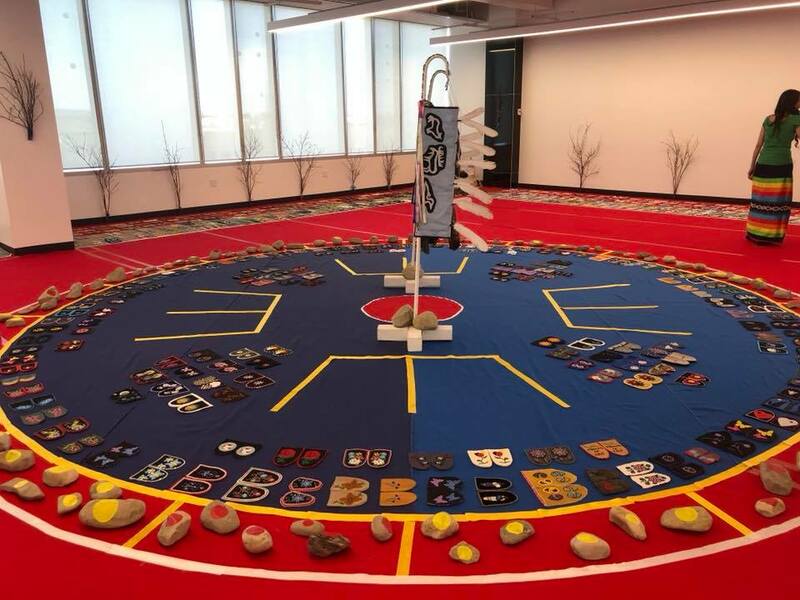 The process to host the installation in Calgary, which runs until May 13 at the Riddell Library and Learning Centre, started two-and-a-half years ago, said Eagle Speaker, and there was mixed reaction from the community on whether it should proceed there. So, those that were meant to be a part of bringing the installation to southern Alberta were a part of it, Eagle Speaker said. The installation of the exhibit happens over four days, with and there is a process that goes into creating the space for the vamps to be in. Medicines were laid down, prayers offered, and songs sung. Red fabric covers the floor, and the vamps are laid out in a way for the visitors to move around them. “I opened up the box that had the vamps in it,” said Eagle Speaker about the process. “And the very first pair that I opened up was in dedication to an infant that was murdered.” Three vamps were not to be moved apart, she said. She said the feedback from the opening ceremony was that the installation provided some closure for families to be able to talk about their loved ones in public. For the larger community it will create some awareness, while for the Indigenous community, Eagle Speaker hopes that the installation will create a sense of togetherness. “Hopefully, re-instilling that idea, that communal idea, of how we have to work together as care-givers for the whole community to take care of each other. The art installation looks different in each community it visits and in Calgary the look of the installation honors the rivers that flow in and around that territory and the meeting places of the Blackfoot. This is also the third to last installation before the bundle will be retired, heading next to Grande Prairie and finally to Batoche, Sask. said Eagle Speaker. The Riddell Library is located at 74 Mount Royal Circle SW in Treaty 7 territory. Admission is free and everyone is welcome.